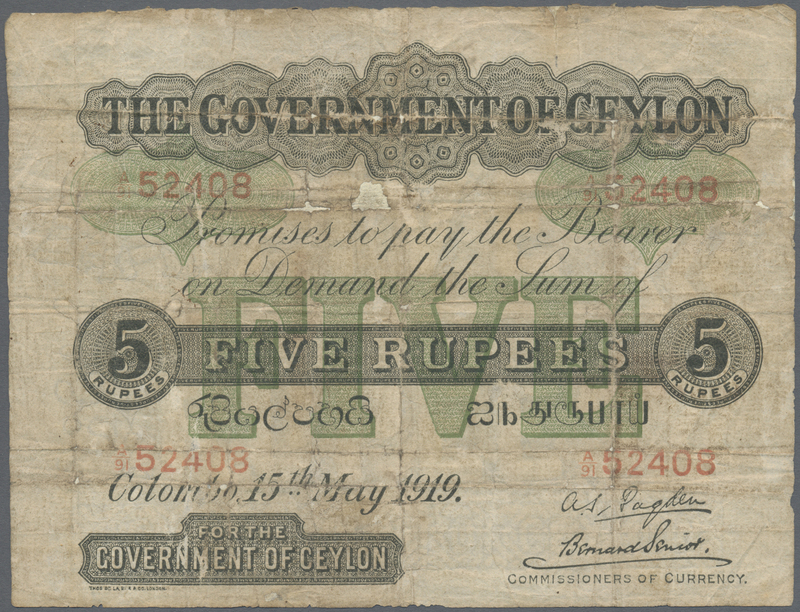 1216 Pick 11b 5 Rupees 1919 P. 11b, used with folds and creases, stained paper, holes in paper which are partially fixed on back side, condition: VG. 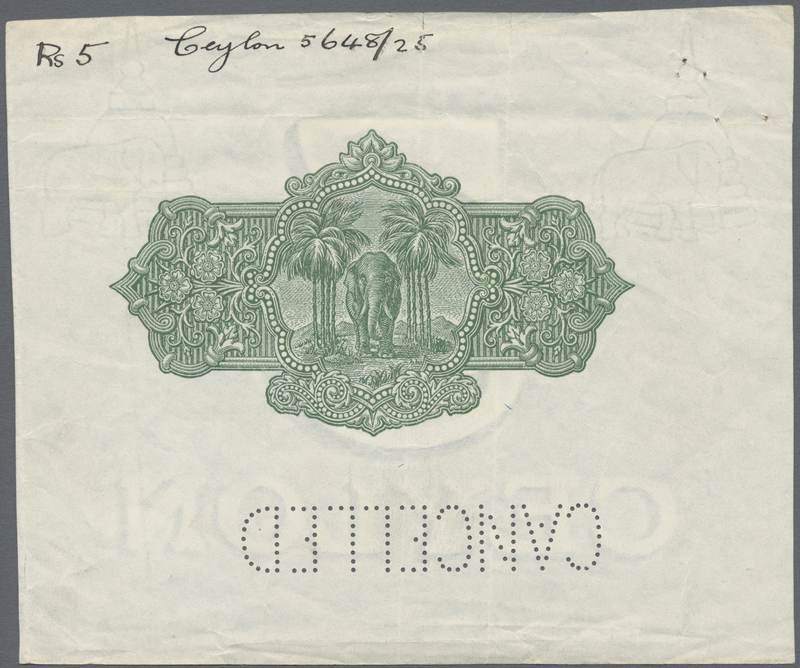 1217 Pick 11b 5 Rupees 1914 P. 11b, rare larger size note in used condition with several folds and creases, light stain in paper, missing parts at lower border, minor holes in paper, in condition: VG+ to F-. 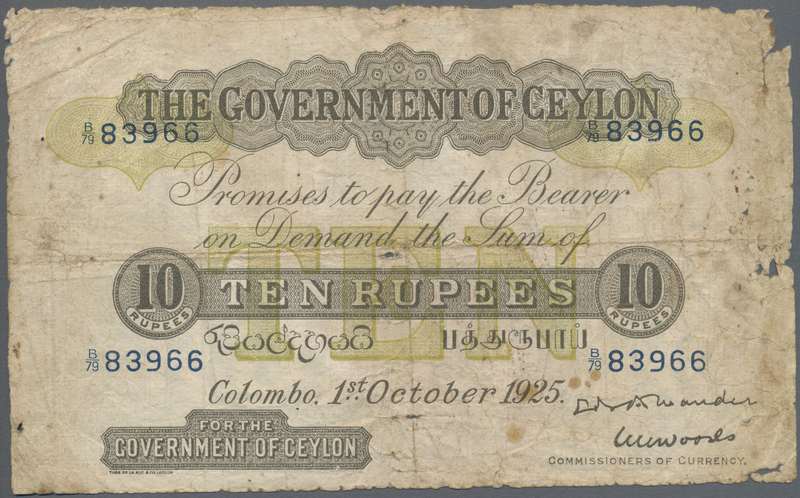 1218 Pick 12c 10 Rupees 1925 P. 12c, higher denomination but stronger used with strong border wear, creases, folds and stain in paper, but no repairs, conditoin: G to VG. 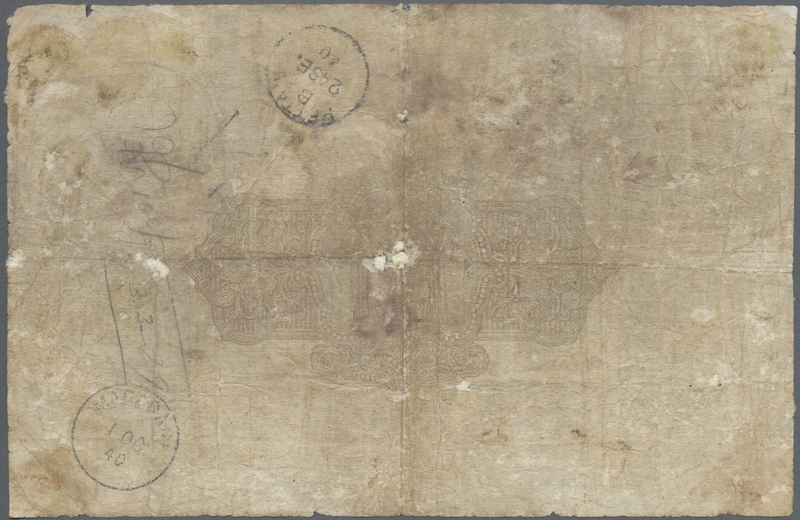 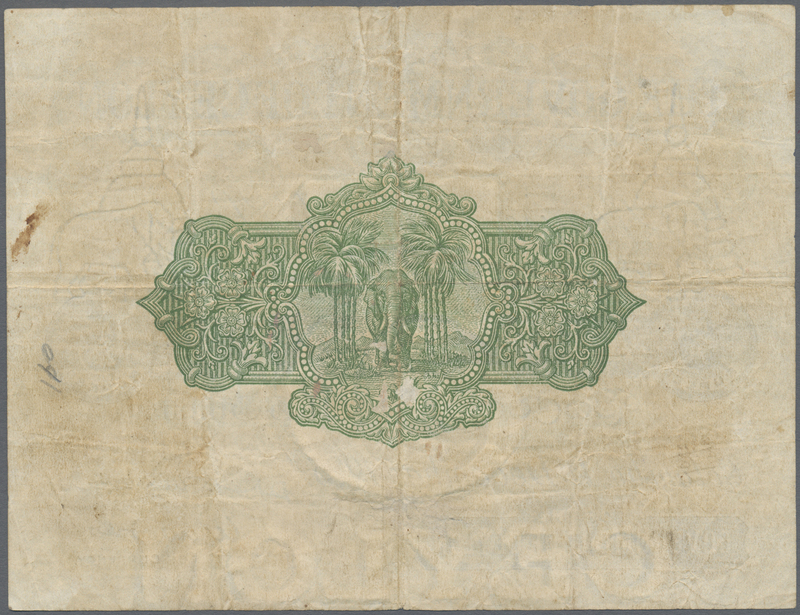 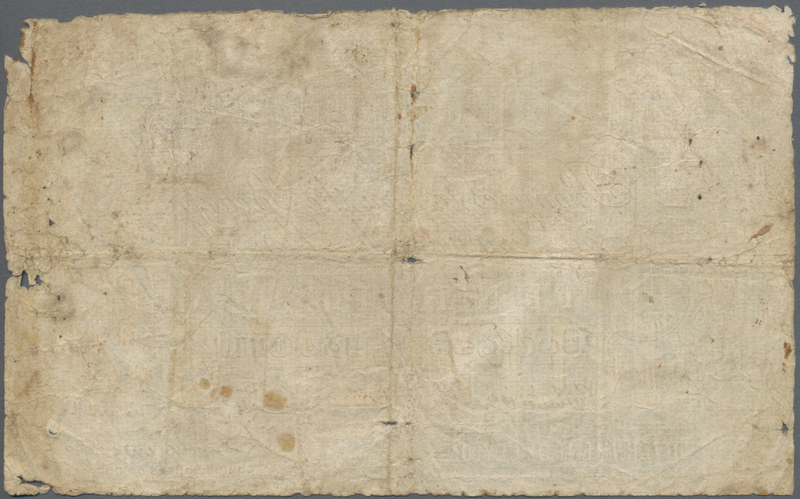 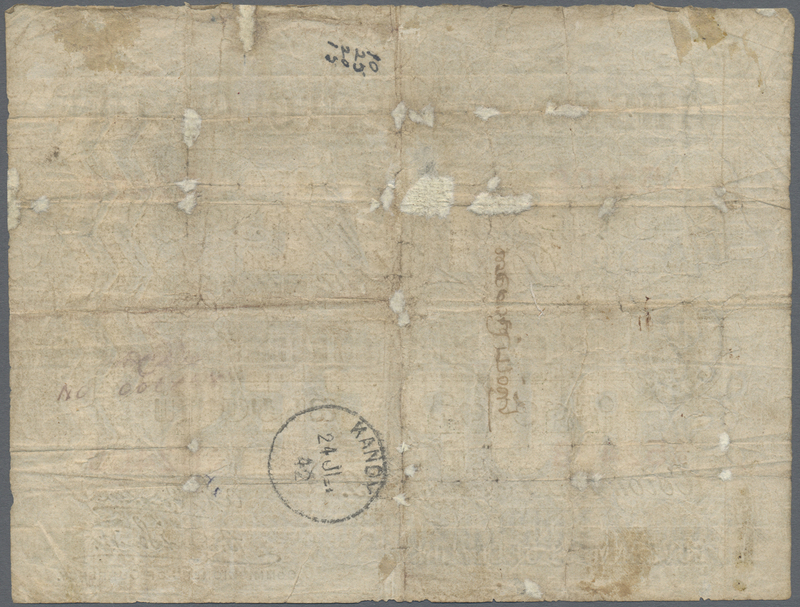 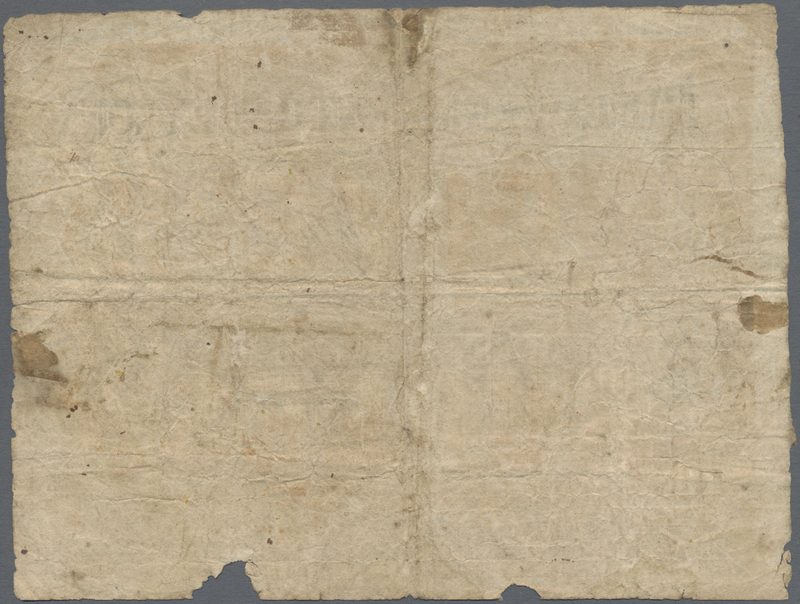 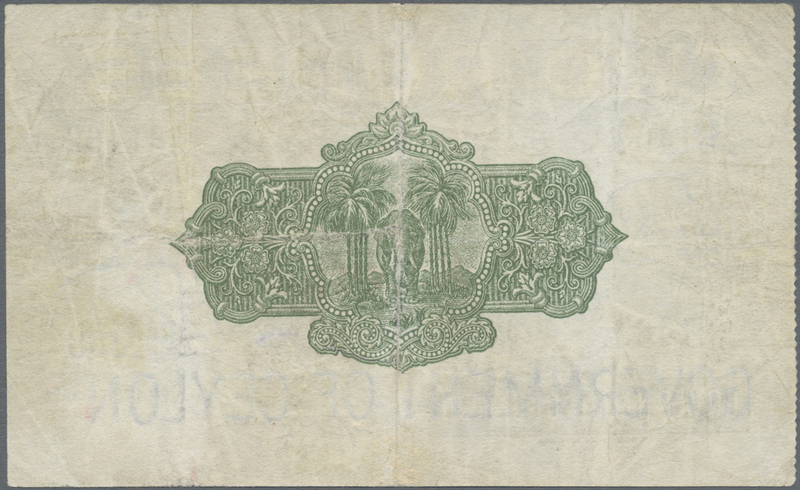 1219 Pick 12c 10 Rupees 1925 P. 12c, used with folds and creases, light stain in paper, upper left and right corners missing, small hole at upper center, lower left corner repaired, condition: VG+ to F-. 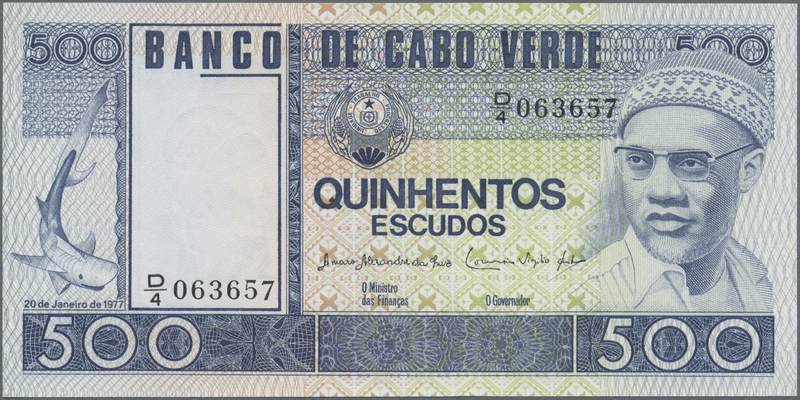 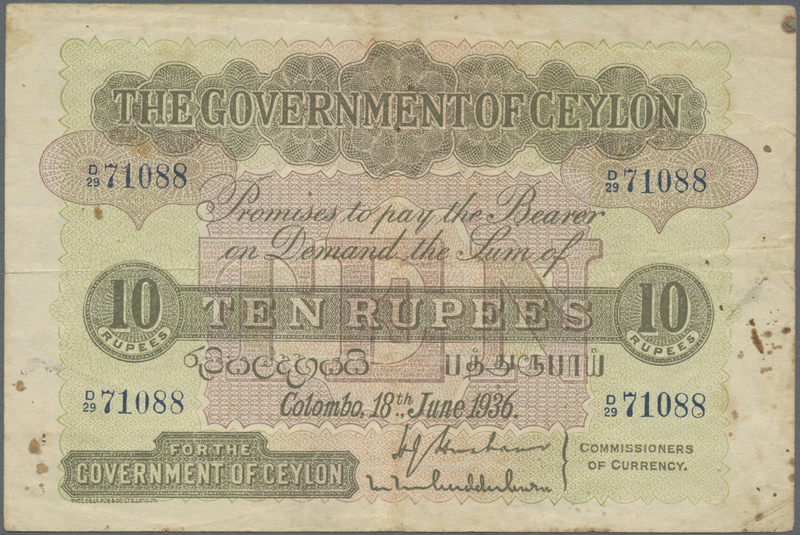 1220 Pick 12c 10 Rupees 1926 P. 12c, stronger used with color abrasions, border wear, pressed, paper thinnings, still intact note, condition: G to VG. 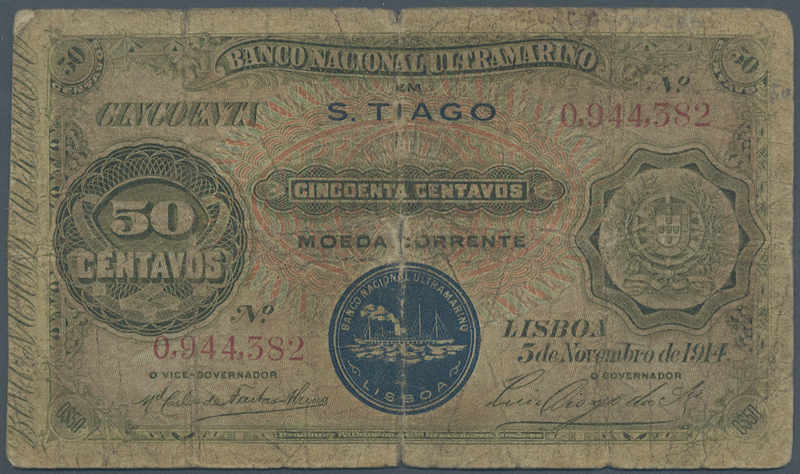 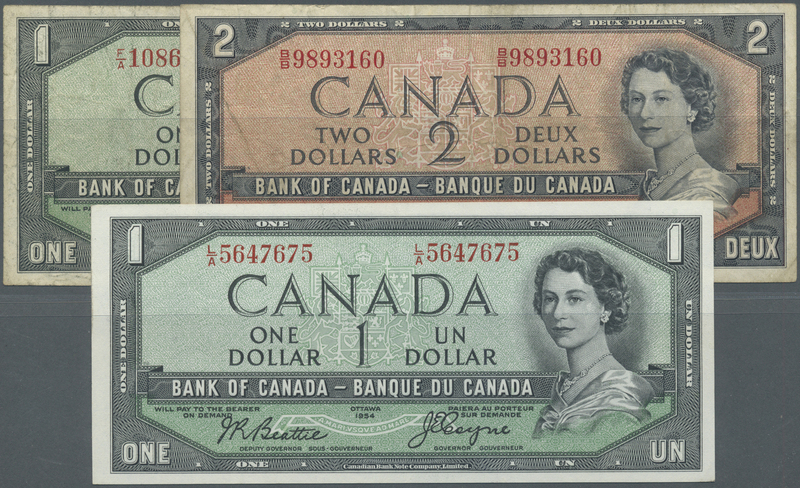 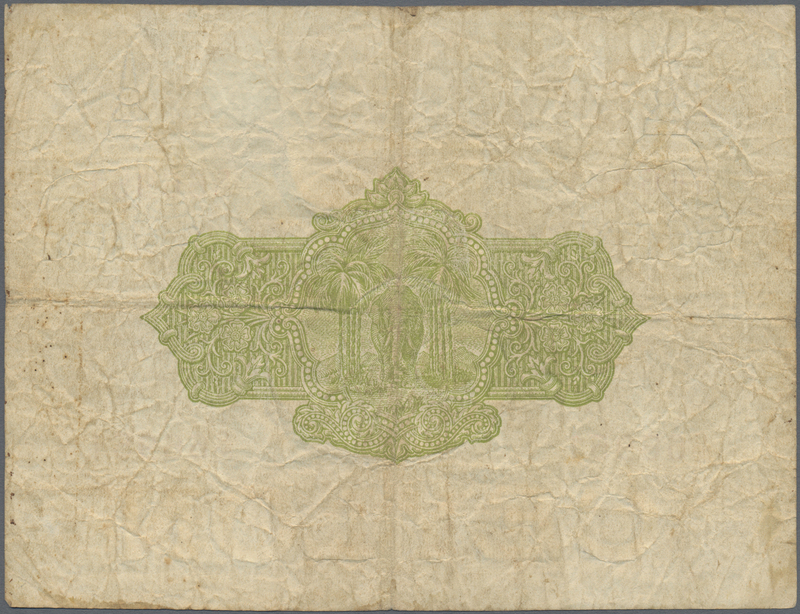 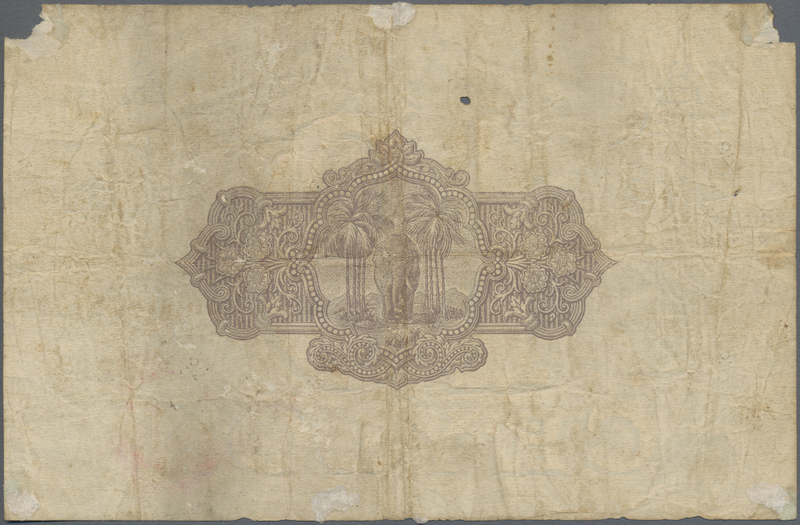 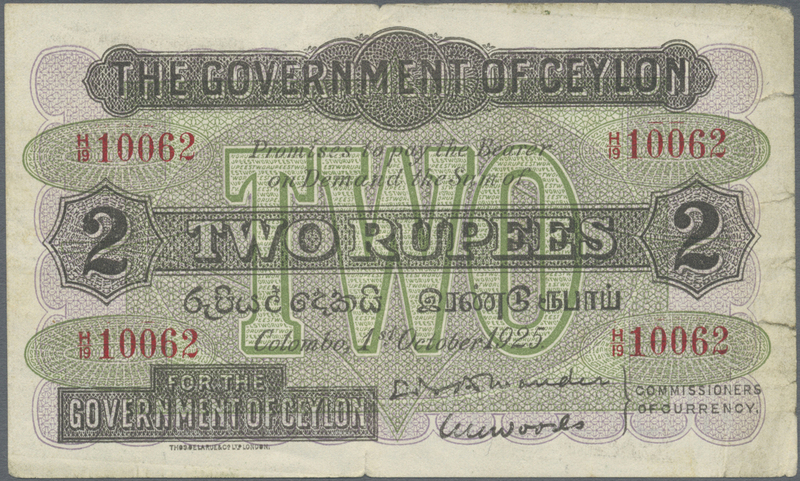 1221 Pick 21a 2 Rupees 1925 P. 21a, used with several folds and creases, several border tears but still strongness in paper and nice colors, condition: F.
1222 Pick 21b 2 Rupees 1935 P. 21b, pressed but still strongness in paper, vertical and horizontal folds, condition: F- to F.
1223 Pick 22 5 Rupees 1928 P. 22, used with folds and creases, no holes or tears, no repairs, still strongness in paper, not washed or pressed, condition: F.
1224 Pick 22 5 Rupees 1925 P. 22, used with folds and stain in paper, minor center tear, no large tears or repairs, still nice colors, condition: F-. 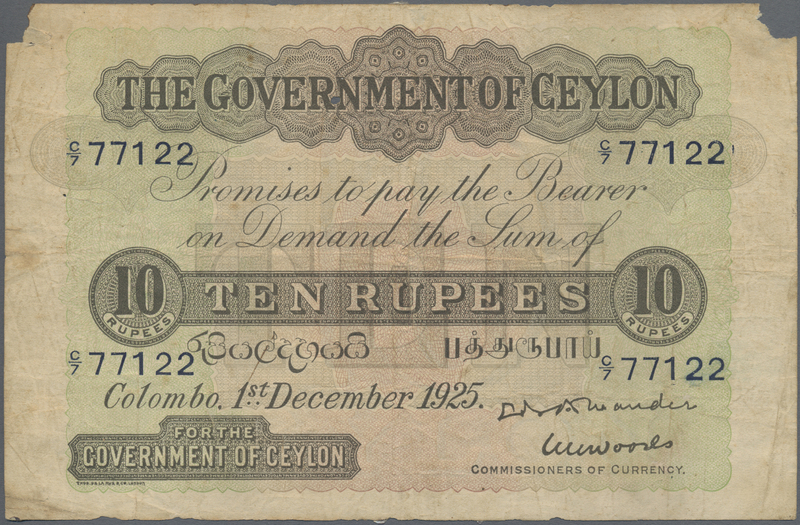 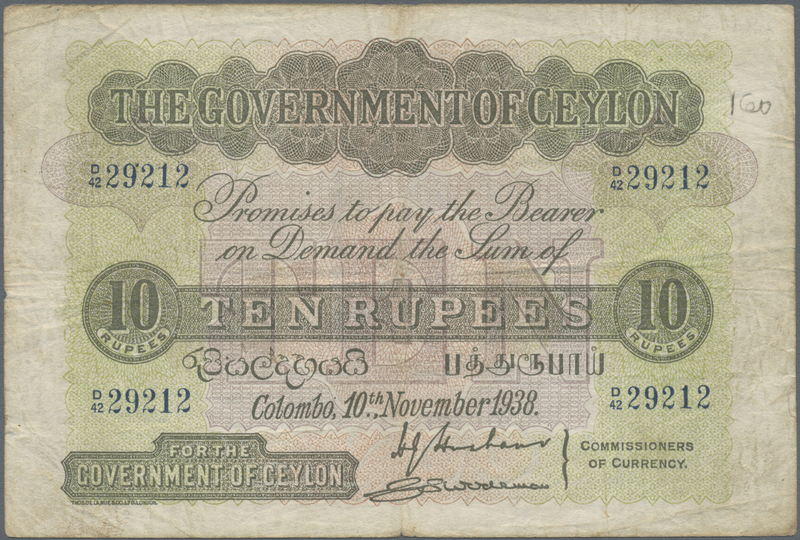 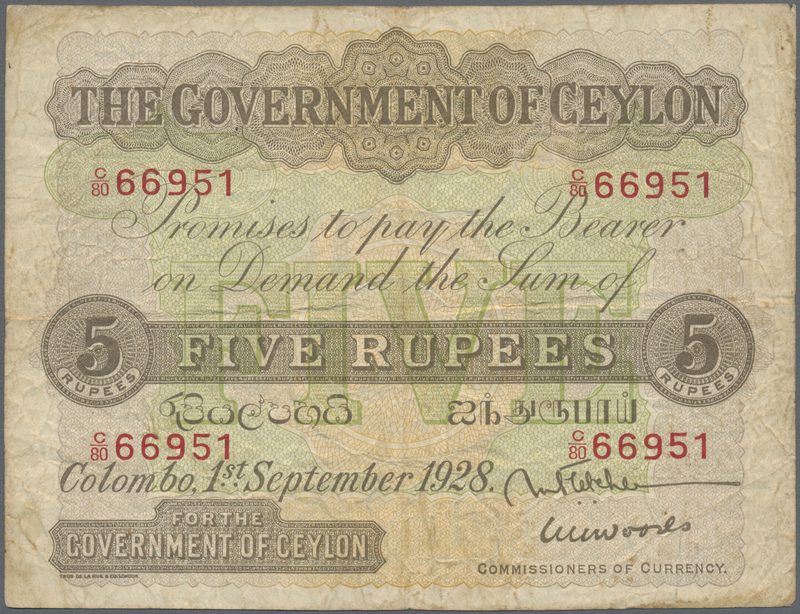 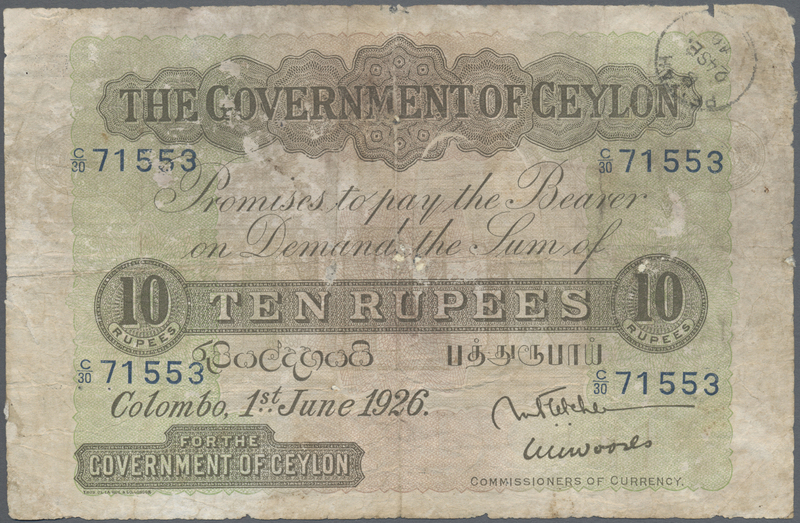 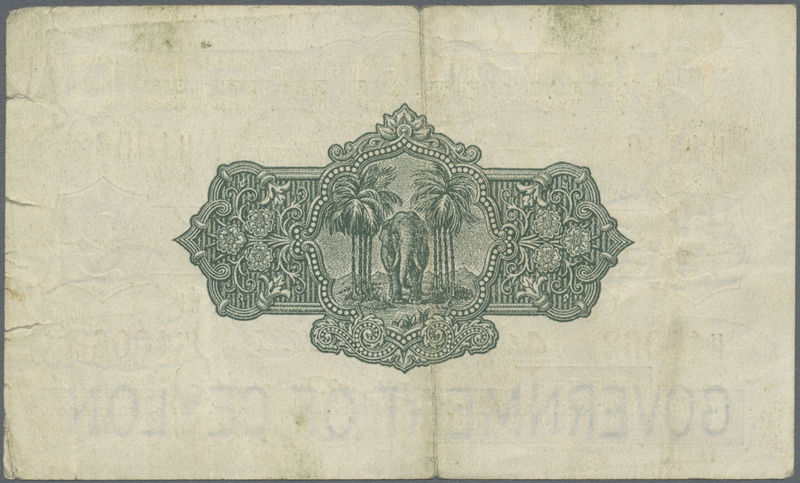 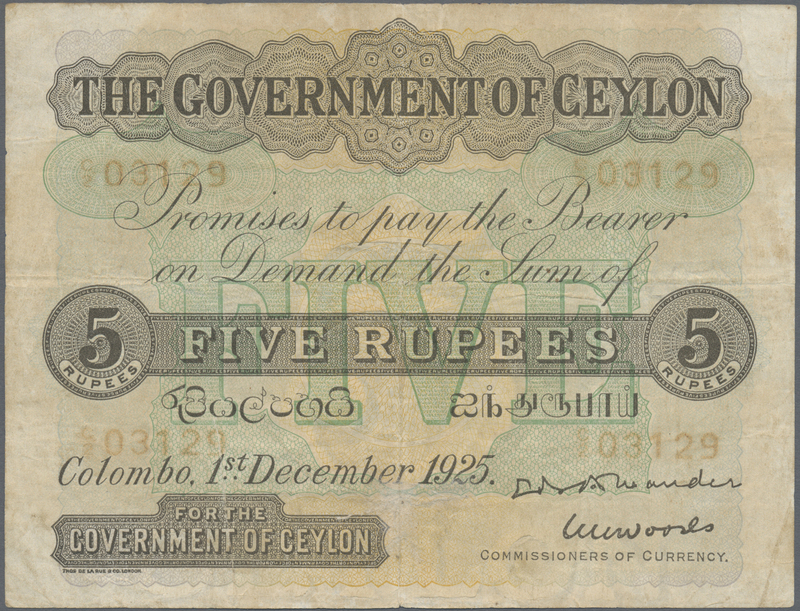 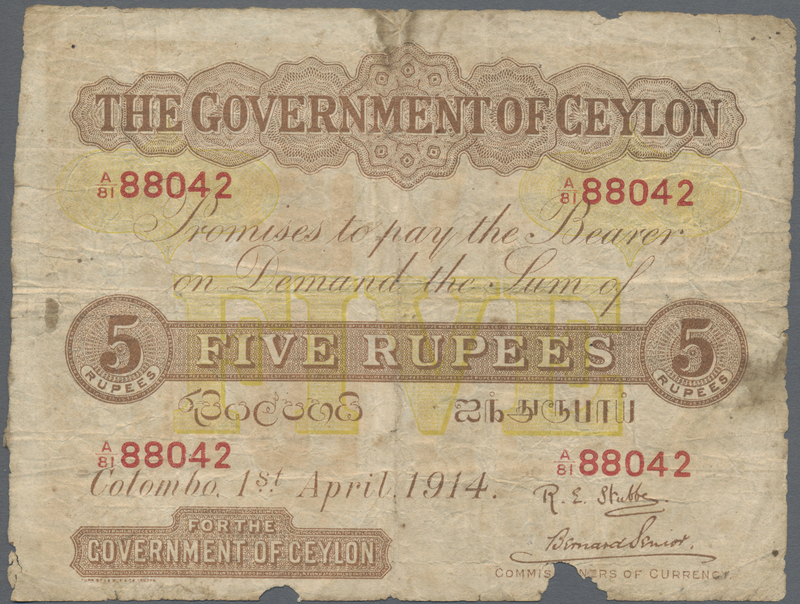 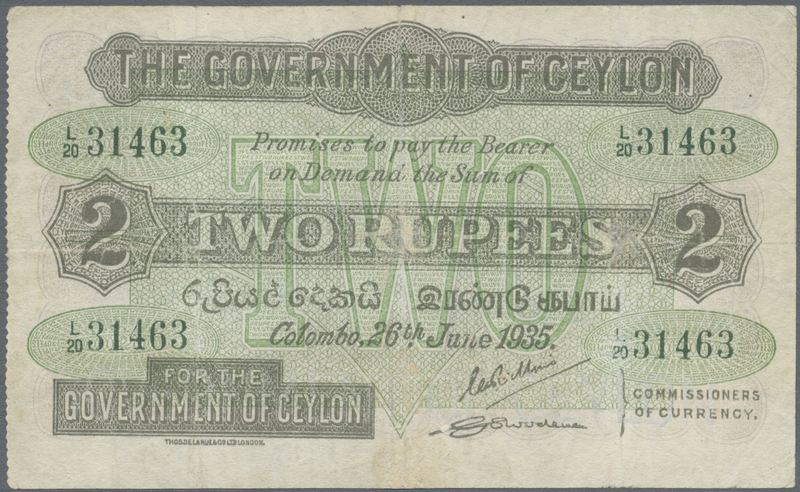 1225 Pick 22p Vignette Proof print on cardboard for the Government of Ceylon for the back side of a 5 Rupee ND(1925) banknote, nice and rare archival item in conditoin: UNC. 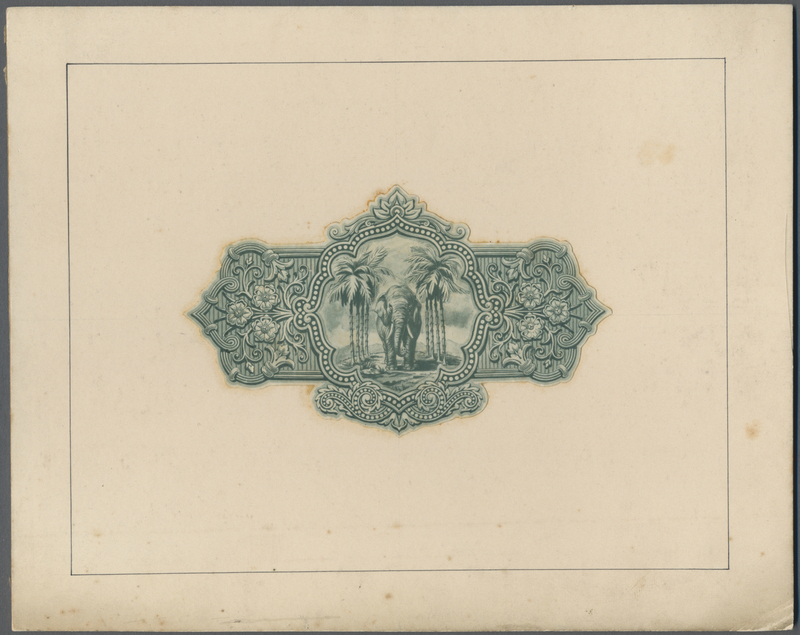 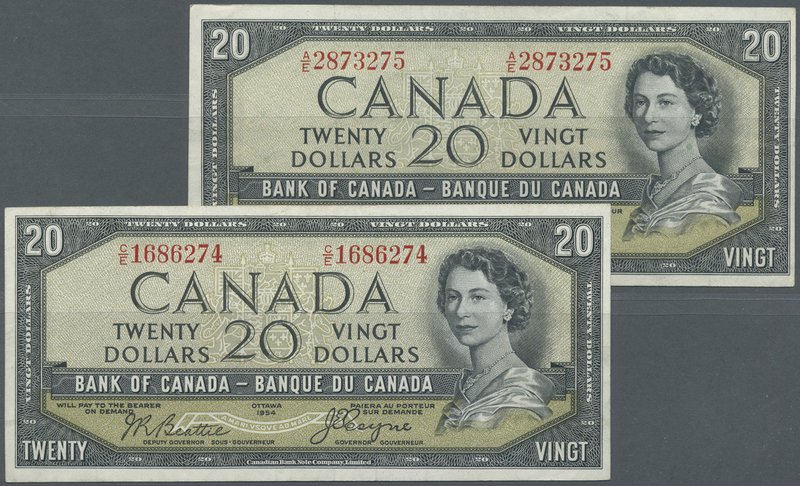 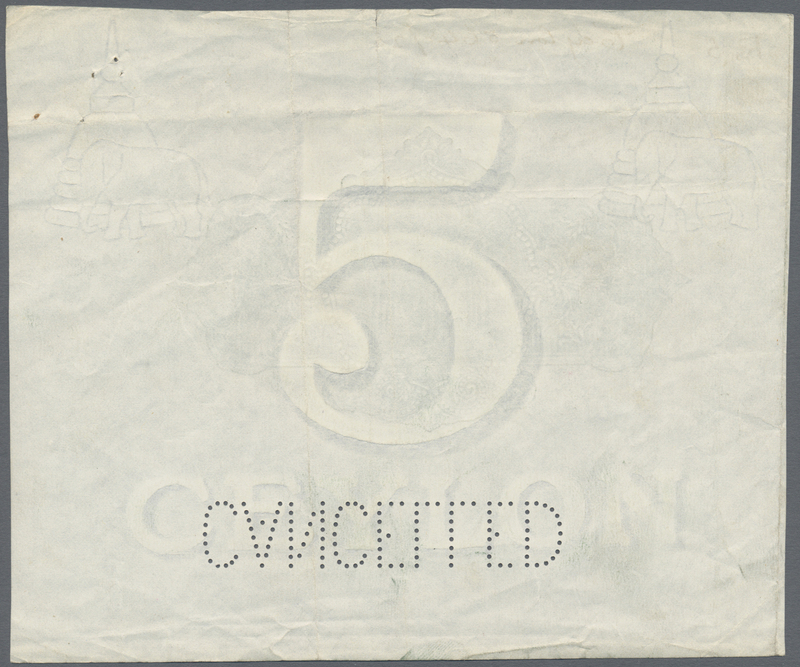 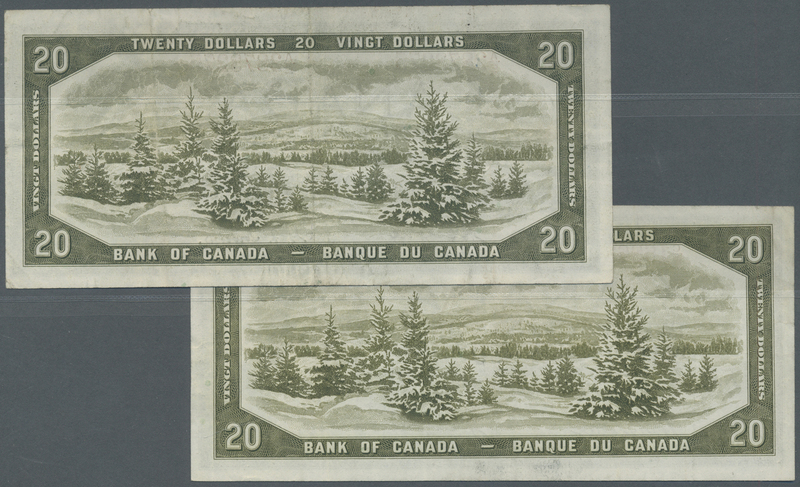 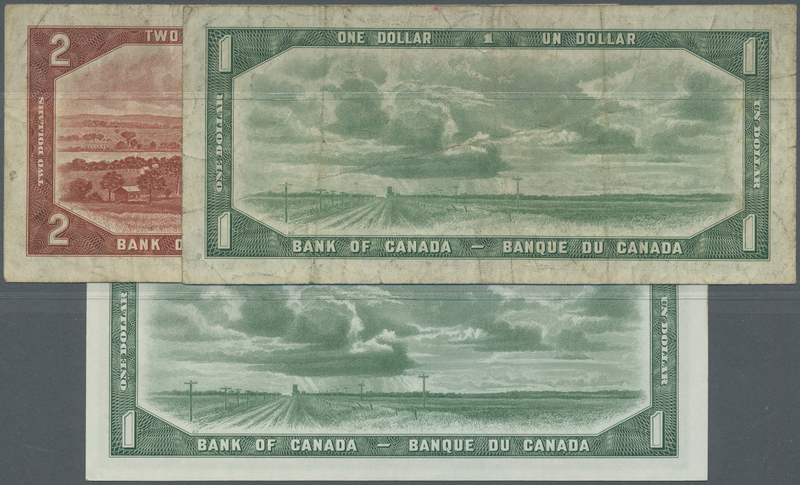 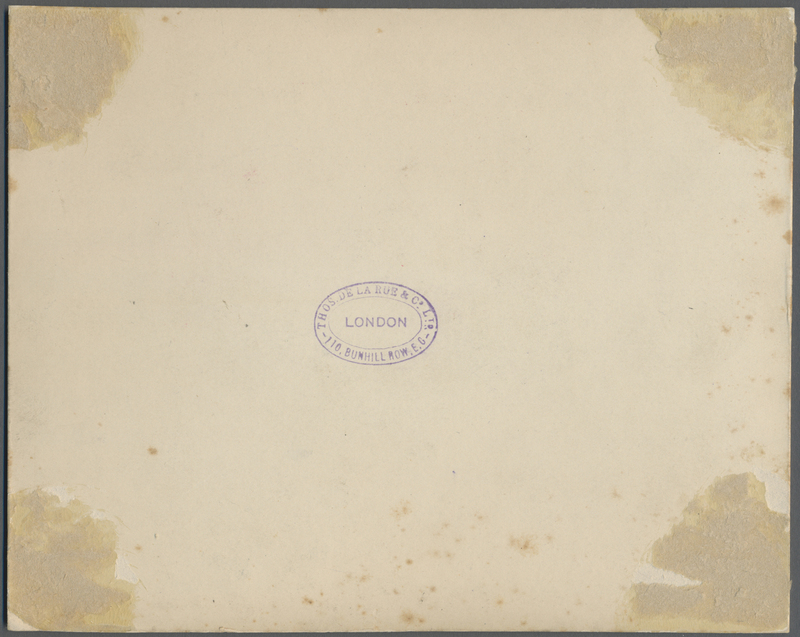 1226 Pick 22p/24p Vignette Proof for the back side of 5 and 10 Rupees P. 22p and 24p on watermarked paper with printers annotations and "Cancelled" perforation, light folds in paper in conditoin: VF+. 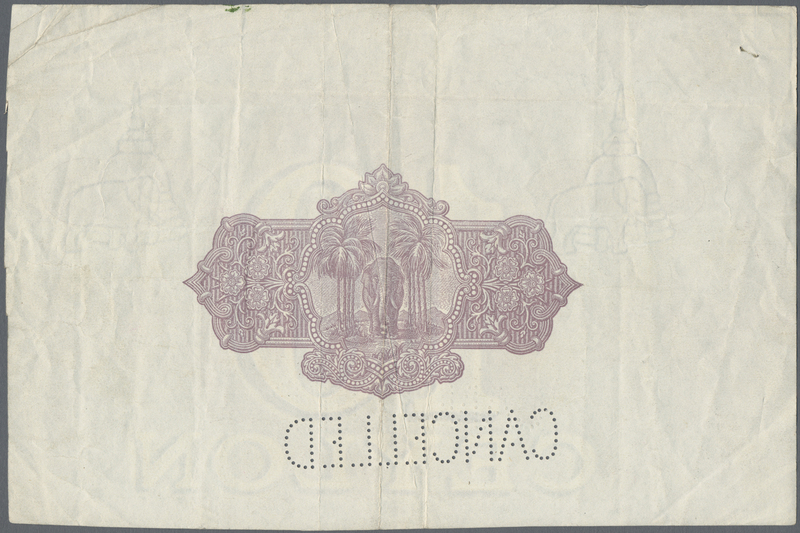 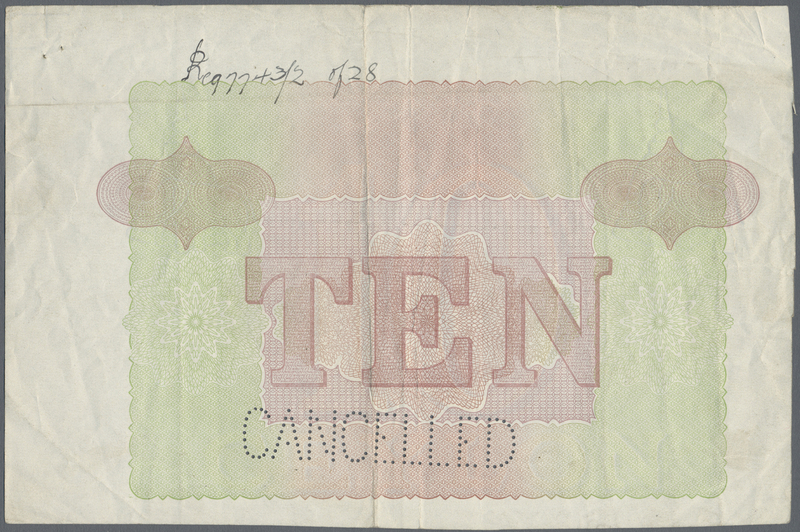 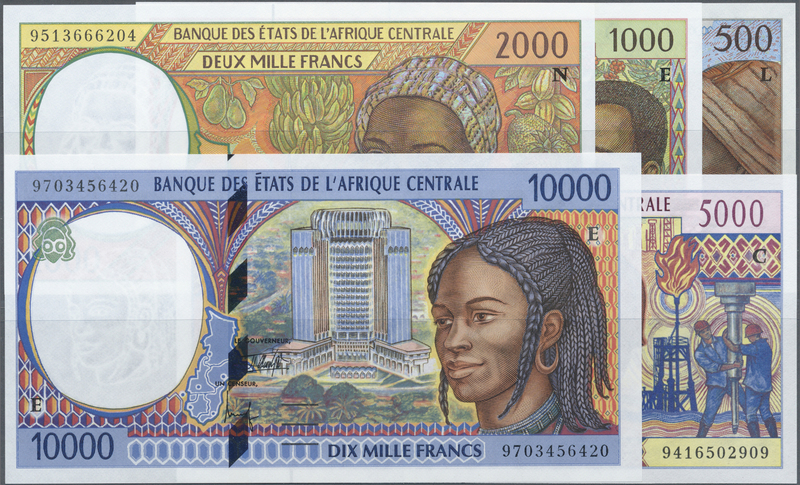 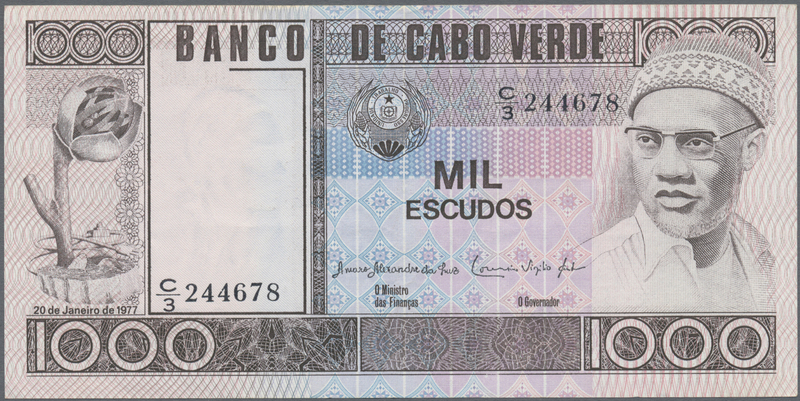 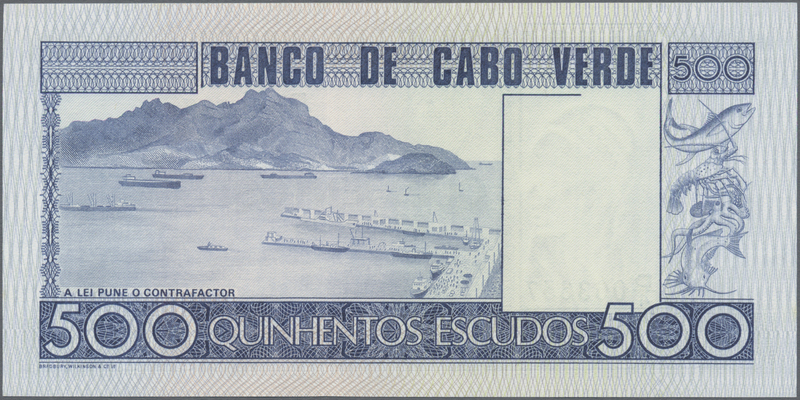 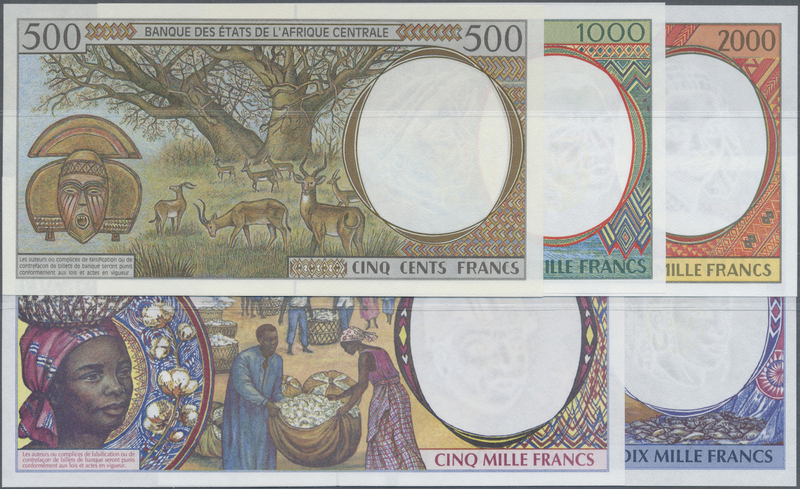 1227 Pick 24p Vignette Proof print for 10 Rupees P. 24p in lilac color, on watermarked banknote paper with "cancelled" perforation, light folds in paper, in condition: VF-. 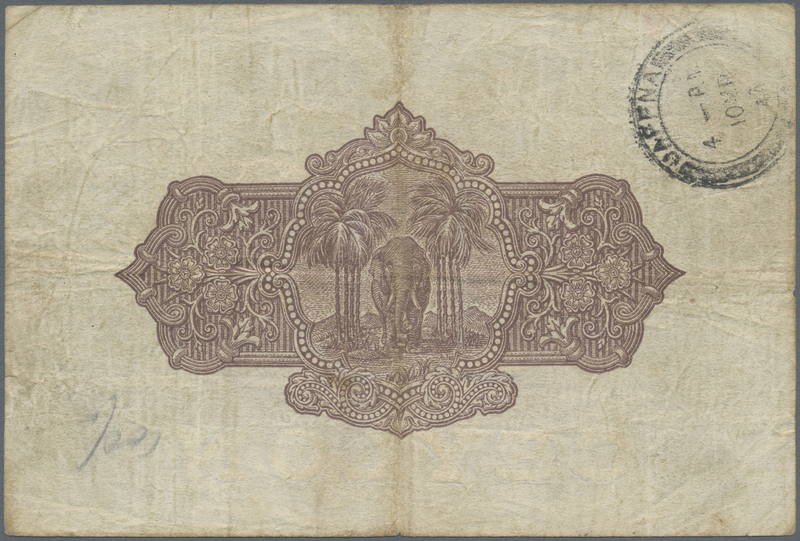 1228 Pick 25 10 Rupees 1936 P. 25, used with folds and creases, stain dots in paper, several pinholes, no repairs, not pressed, condition: F to F+. 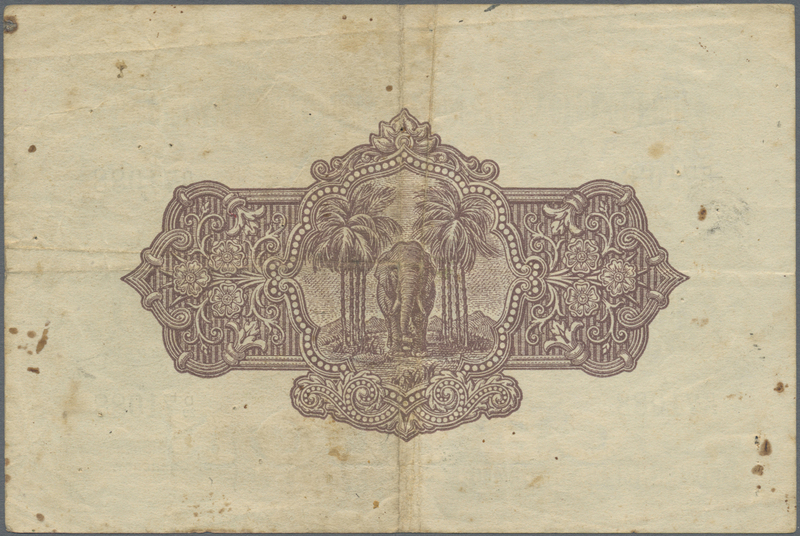 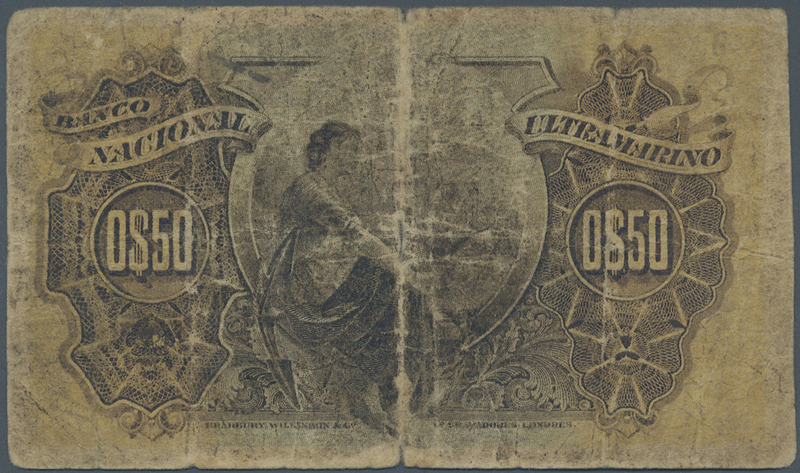 1229 Pick 25 10 Rupees 1938 P. 25, used with folds and creases, light stain in paper, no holes, still strongness in paper, not pressed, condition: F to F+.